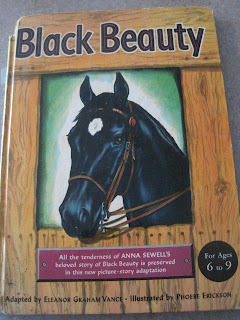 Who doesn't remember the first time they read Black Beauty? Ginger, Merrylegs, the kid that made Black Beauty sick, the mean lady who used the check rein. I had this Golden Book of course, but i also read the full book, saw the movie (baaaad), and adopted the thesis hook, line, and sinker. May all horses have BB's happy ending. You are a bad, bad lady for making me cry at work. I can't even handle looking at BB's photo any more, much less reading the book (although I am quite capable of quoting passages from memory). It just KILLS me. Yes, Beauty's/Anna's message is still extremely relevant: horses are totally dependent on us. Try not to let them down with stupid or abusive handling/riding. Try to ensure the best future possible if you must re-home them. And in today's economy, don't breed them in the first place when there's no market. Through the huge lump in my throat, I say thank you anyway for reminding us. You should check out my 'Black Beauty' ending..got my pony Iceman back after 12 years. I glossed a lot of details over, don't mention in my post how underweight and injured he is, etc. Have to be PC with it right now. While cleaning out my parents' attic recently I found my childhood copy, which was originally my godmother's childhood copy, circa 1920-something. My husband was intrigued by the cover, and being a boy with no interest in horses, had never read it, so we took turns reading it out loud to each other. It was funny to see him get all outraged over Victorian animal cruelty. It's a really great book, isn't it? I was amazed at how well it stands up today. Got a 1945 copy sitting right here beside me! The story and message never get old. The thought of Ginger always makes me tear up. I am not crazy about the movie either, but occasionally I hear the music used in another video and I recognize it immediately as "Black Beauty music". The only horse person that I ever met who did not like the book was my original dressage instructor. She said that the book encouraged people to let the horse walk all over them rather than risk being that check rein lady. I can kind of see her point, but I still think it is a good interpretation of the animal perspective. This is the book that started everything.I LOVE this book! 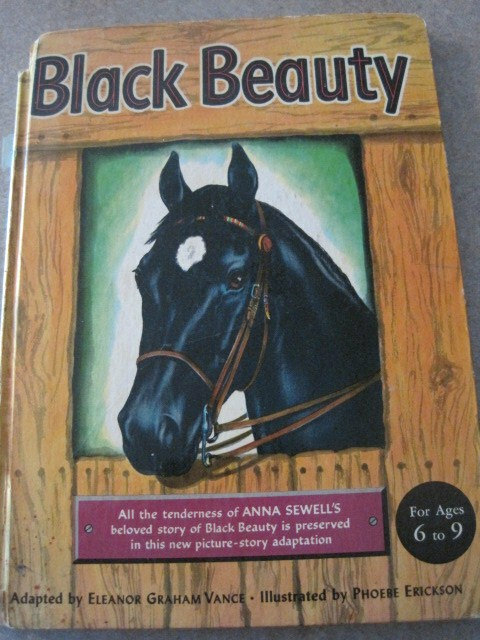 My personal horse book passion was The Black Stallion. The only time I really lost my temper with my mother as an adult was when, in a cleaning fit, she gave my complete collection away. 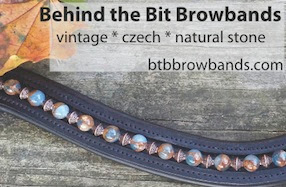 I have since replaced them through the joys of e-bay. Read it probably 20 times. The part about the poor cabbie driver who always took care of BB before he took care of himself always stuck with me. Such a great book! Can't wait until my girls can read it. I just packed up my copy! I had to stop and look through it - the illustrations are beautiful!